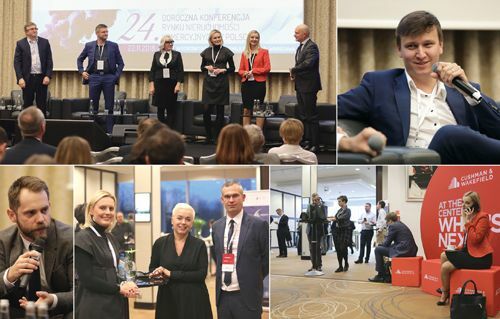 Over 150 people came to the 24th Annual Property Market Convention and it began with a sparring session hosted by Ewa Andrzejewska, the editor-in-chief of Eurobuild Central & Eastern Europe magazine. Two giant figures from the real estate market sat opposite each other: Przemysław Krych, the founder of Griffin Real Estate and Paweł Dębowski, the chairman of the European real estate at Dentons. Poland is booming but both agreed that it is only for the time being that there is no cause for concern. Poland has has become the star market in European logistics and the office market is also thriving. Total investment in the Polish real estate is expected to be around EUR 6 bln. “We are, however, at a crossroads, because low labour costs can no longer be counted as one of the country’s advantages” said the founder of Griffin. He also pointed out that in previous years, before the global financial crisis, Poland was protected by rising consumer spending and a high level of EU investment, which is coming to an end. “The rising trade war between China and the US is sure to have an impact on Germany. As a country that has strong trade links with Germany we too could be harmed,” said Paweł Dębowski. So can we expect a market correction soon? They both agreed – not for the next 18 months. New technology is without doubt the topic that heated the sector up over 2018. And it was also the topic that was next examined with a panel discussion entitled ‘Tantalising tech’. Proptech is improving lease management as well as working conditions for those in the industry and it is also proving to be a magnet that attracts young talent to employers. The debate was moderated by Bartosz Dobrowolski of Proptech Poland. Also taking part were Mirosław Ryba (EY), Aleksander Szybilski (Cushman & Wakefield) as well as Bartosz Świniarski (Kuryłowicz & Associates). All the speakers agreed that every real estate sectors is going to benefit from new technology, but this will be especially true for offices and hotels. Also under discussion at the conference was how capital is being attracted to the market and this was a topic raised during the panel entitled ‘The race for warehouse space’. Robert Dobrzycki (Panattoni Europe) spoke out during the discussion moderated by Tomasz Buras (Savills) about the interest shown by investors from the East and especially from Asia. “Take a look at the Chinese who have a top-down order to build up their the entire supply chain in Europe. They have their plans and they are implementing them in a methodical manner,” he stated. Logistics companies, which are closely followed by their warehouse and distribution space developers, stress that the decision to invest in a new project is dictated by access to labour, which is becoming ever more difficult in Poland’s largest warehouse hubs. This is pushing development into new locations such as the east of Poland. “But the question is how liquid will such markets be when it comes time to exit,” asked Piotr Bzowski (P3). The other members of the panel included Agnieszka Góźdź (MLP Group), Paweł Sapek (Prologis), Andrzej Pawlak (DHL), and Włodzimierz Skonieczny (ING Bank Śląski). It was then time for Tomasz Trzósło, the head of JLL in Poland to take to the stage to reveal the secrets of the market, including those of the warehouse sector, but now it was the audience that took the role of moderators. Under the cross-examination, he confirmed that in his opinion investment volumes would top EUR 6 bln, but if you were to ignore the largest deals completed by the Griffin Group, such a result was only average. After a coffee break it was time for another presentation, which this time was given by Marlena Biardzka (Z-Factor) and Władysław Grochowski (Arche) and entitled ‘Luxury in an age of sharing’. The two speakers agreed that the hotel market was doing well and that there was still plenty of room for new projects but the real challenge for the sector is finding qualified and committed employees. And what state is Poland’s retail market in? In the discussion panel entitled ‘From trade temples to leisure hubs’ the subjects ranged from the ban on Sunday trade to multichanneling. The panellists agreed that the biggest change that has had a major impact on the retail market in Poland is the restriction placed on Sunday trading, which was introduced in March 2018. “We do not oppose retail employees being given two free Sundays and we even proposed such changes but these should be based on the labour code rather than a poorly drafted act that is harmful to the market,” said Renata Juszkiewicz (Polish Organization of Trade and Distribution). The talk turned to retail chains, which are now using online sales to a much greater extent and have many more opportunities to do so than malls. This is causing friction between tenants and landlords, especially when a store’s rent is based on turnover. Anna Malcharek (Gemini Holding) stated: “I’m obsessed with the idea of creating a digital shopping centre similar to those in the West. We are looking at how we can build up our omnichannel presence.” Other panellists included Marek Janecko (Smyk) and Aleksander Walczak (Dekada). The discussion was moderated by Marta Machus- Burek (Colliers International). Lunch was followed by ‘The construction conundrum’ panel. “Respected construction companies price their services according to current rates and expect to go into partnership with the investor,” said Łukasz Kozerski (CFE Polska). He also pointed out that having had their fingers burnt on previous contracts, general contractors are now refusing to take on new projects whenever they see even the slightest risk. The discussion was moderated by Rafał Ostrowski (‘Eurobuild CEE’) and those on the panel also included, Wioletta Fabrycka (RD Bud), Mateusz Witczyński (Astaldi) and Paweł Sajewicz (Euler Hermes).